Ripple Thoughts: DRIVING Grab fulltime? Considering driving Grabcar fulltime? Initially I have no doubt about it, since I have gotten a suspension for the second time, I feel so insecure about this earning platform, I have lose faith on it. I explained to the man that was my Mistake I made, as I accept this job when I was still sending the previous rider to her destination, we were chatting happily, when I said "Bye-bye!" to her, I "automatically click "Drop off" which that time didn't realise that it was actually a new job for "pick up". So I called the rider to ask where is the location for pick up, I will drive to pick him up, when I was almost there, I went back to the app, ready to send a message to rider that I am nearby, but I saw a message sent to me earlier, he wanted to cancel the trip, I gave him a call to confirm with him despite of I was already driving towards the place, sadly he said yes, the thing I can do was just "drop off". Many times we faced this situation that rider cancel job when we already near. Unluckily this case was because I had clicked the pick-up, and didn't realise that actually I can just give grabcar customer service a call, but I didn't know about we MUST give CS a call to report it, we WERE NOT TOLD TO DO SO. To accepted the job is a total loss to me, I even had to pay 20% of Grab commission yet I get this treating me back! The support isn't any support at all. Well I know they have plenty of drivers now, who am I that the team will pay attention to. No exception! The first suspension was just simply the hang of the old version app. Drivers have no protection at all, Grab team has becoming very pro and I would say - prideful. 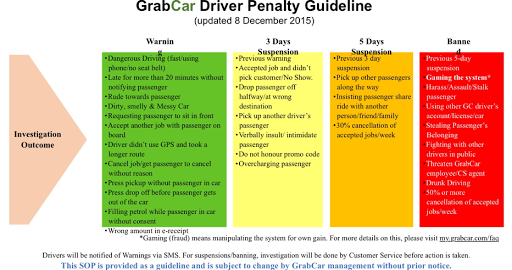 By looking at this Grabcar Driver Penalty Guideline, I am already in the ORANGE stage, meaning I will be banned permanently if next mistake made. I am still can't get over it! What?? 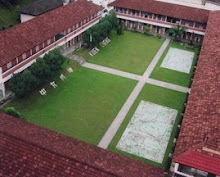 I am in ORANGE STAGE! WAKE UP! This is so serious man, I can just jobless because of any rider trying to behave like the one before! Or the problem of the app arise! May be you need to reconsider to become a fulltime driver for GrabCar.